Happy Saturday, everyone!! Before I head out to the wedding I have to shoot today, I have a card to share with you!! My friend Nina needed another card to share on her blog for today's The Craft's Meow Release Blog Hop, and I was happy to oblige!! She has designed a new stamp set called "Love Dwells Here", which matches her Spellbinders "Home Sweet Home" dies. I LOVE it when stamps match dies....it makes things so much easier! I created a card that would be perfect for welcoming someone into the neighborhood, or when attending a housewarming party with a gift! I chose soft colors for this card, but added a bit of shimmer & sparkle to it! I love how it turned out....check it out! 1. Make A2 card from oatmeal cardstock. 2. Cut pink paper slightly smaller, then diecut an eyelet lace border from the bottom of it. 3. Distress ink the edges of both pieces, then adhere to the front. 4. Cut a block of map paper, distress ink the edges and adhere to the middle. 5. Cut two strips of striped paper, punch a border to the thicker one, and distress ink the edges. 6. Adhere the punched border to the top of the map paper, and the thin strip to the bottom. 7. Tie ribbon around the top of the card, then zig-zag stitch along the seams of the striped papers. 8. Diecut the house bottom from fabric, and the top from oatmeal cardstock. 9. Stamp the house top and cover in glitter. Adhere the two cuts to the middle of the card. 10. Diecut the heart and tag, then stamp as shown. Adhere the heart to the middle of the house, and the tag to the bow middle. 11. Top the bow with a spool button and pink pearl. 12. Glitter two small flowers and paper leaves, and adhere to the corner of the house with a pearl centered flower. 13. Add three pink pearls to the bottom of the card to finish. Hi Lea! Oh my goodness! This is the most gorgeous card I've seen in a long time! I sat and studied it! Thanks for the "how-to's"! You make it sound easy...but that kind of creativity is a real gift. So glad you were willing to share it with us today at SSiC! Please come back again!! Wow, are those colors and details gorgeous!! Very, very pretty, Lea. Love that sparkly roof! So, so pretty, Lea! You never fail to inspire! Thanks so much for playing along with us this week at The Play Date Cafe! This is SUCH a cute card, Lea! You are a TRUE friend and a WONDERFUL paper crafter! Hi Lea, I am now your newest follower! This card is just beautiful and looking through your site, all your cards are!! Thanks for including a list of the supplies you used, that is so helpful to newbies like me! Look forward to seeing more from you! Gorgeous!!! Love this soft and pretty card with all the goodies...great job!!! 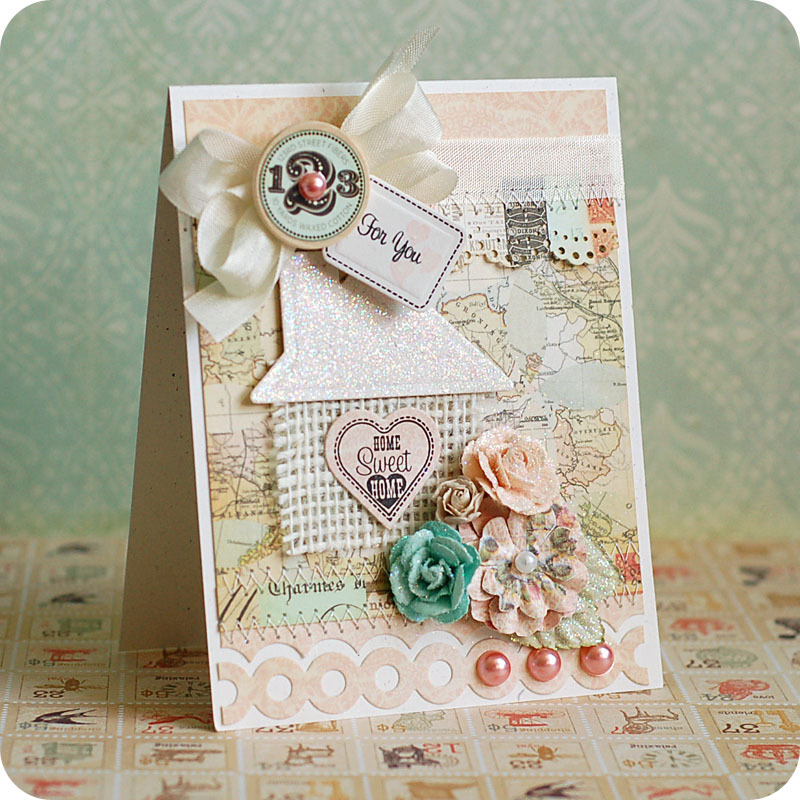 Stunning card, love the soft colors and all the elements you added. Best of luck with the challenges! I am a new follower.